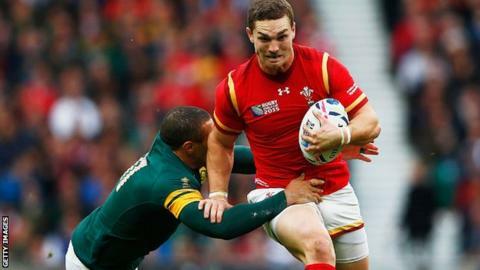 Wales wing George North is unlikely to return to a Welsh region for the start of next season. The British and Irish Lions player, 23, is out of contract at Northampton Saints in the summer of 2016. But there have been no formal offers from either the Welsh Rugby Union or the regions to bring the 55-cap star back to Wales. Saints coach Jim Mallinder has said he is "very, very confident" North will stay with the English Premiership side. North, who scored two tries in three Tests for the Lions during the victorious 2013 tour of Australia, moved from Scarlets to Franklin's Gardens in 2013. The Welsh regions are unable to match the spending power of the big English and French clubs. However, a national dual contract - 60% funded by the Welsh Rugby Union - is being used to bring centre Jonathan Davies back to the Scarlets from Clermont Auvergne next season. But union chairman Gareth Davies has said offering big money to tempt stars like North back to Wales may not be the answer. "I think we've got to be fair to the other players as well. We don't want too much of an imbalance in what we pay players," he said, adding there is a "finite pot of money" available to sign players on national dual contracts. Scarlets coach Wayne Pivac has already said they are "not chasing" their former player, instead confirming that they are in talks with fly-half Rhys Patchell over a potential move from Cardiff Blues.